Programmes helping households to save on their heating bills have faced significant cut backs since 2012. These cuts have seen a drastic fall in the numbers of houses receiving help to warm their homes - statistics show that the figures have fallen by 75%. 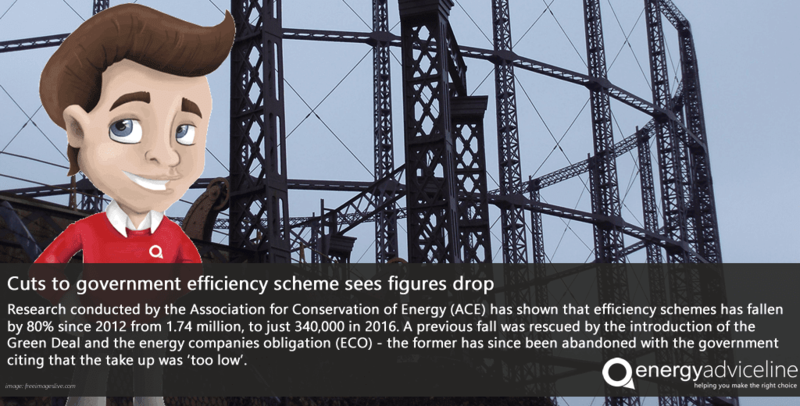 Research conducted by the Association for Conservation of Energy (ACE) has shown that efficiency schemes has fallen by 80% since 2012 from 1.74 million, to just 340,000 in 2016. 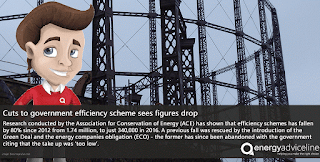 A previous fall was rescued by the introduction of the Green Deal and the energy companies obligation (ECO) - the former has since been abandoned with the government citing that the take up was 'too low'. Julian Morgan, managing director of the switching service Energy Advice Line, said that this behaviour was unacceptable. "More needs to be done to help homes, as it does businesses, to help people understand their energy bills, make sense of the tariff, and find out where cut backs can be made in order to start making some significant savings. "What a lot of people don't realise is that while savings start by switching supplier, it's this colder time of year that bills peak and users need to be more conscious of where they should be making cut backs." Meanwhile, the Energy Bill Revolution, an alliance of 200 organisations and businesses, said the blame for the “devastation” to the country’s home energy efficiency programme lay with Chancellor George Osborne. Energy regulators should limit the amount of money energy suppliers can back-bill consumers when they charge them incorrectly, according to the Energy Advice Line. Julian Morgan, managing director of the price comparison, switching and advice service for energy users, said householders and businesses should not have to suffer unexpected demands for money due to billing errors that were not their fault. 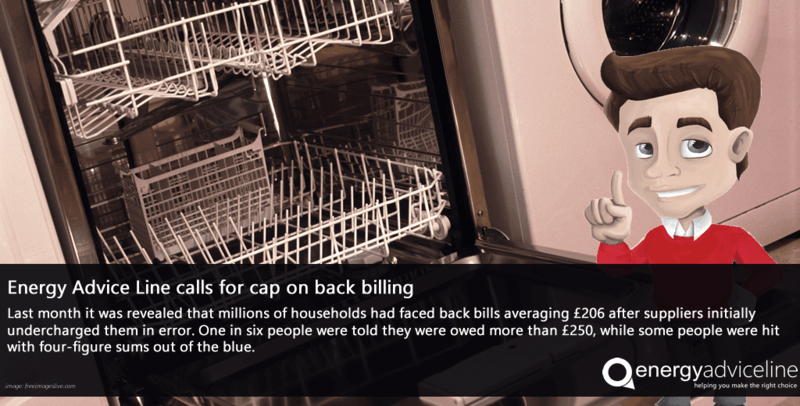 Last month it was revealed that millions of households had faced back bills averaging £206 after suppliers initially undercharged them in error. One in six people were told they were owed more than £250, while some people were hit with four-figure sums out of the blue. Citizens Advice, which revealed the back billing problem, said 16,000 people had contacted the charity last year with bill concerns, and were worried about how they were going to pay. "It's not fair that suppliers can back bill customers out of the blue for up to 12 months worth of gas or electricity, when they themselves were in error, due to a technical problem for example," Mr Morgan said. "This places an unforseen burden on the budgets of households, as well as businesses, which I know suffer from this problem too. "Customers should not have to pay the price for suppliers' mistakes. Consumers are already struggling with skyrocketing energy bills and this is the final straw for many who find it difficuly to make ends meet. "Ofgem should drastically reduce and cap the amount of money suppliers can back bill customers. "It should also ensure that consumers have a reasonable length of time to pay these belated bills. "There is little incentive for suppliers to issue accurate bills when they can demand payment retrospectively. This is unfair and needs to change." The Energy Advice Line has cautiosly welcomed the launch of a new business energy audit service aimed at helping small and medium-sized firms reduce their energy use and carbon emissions. 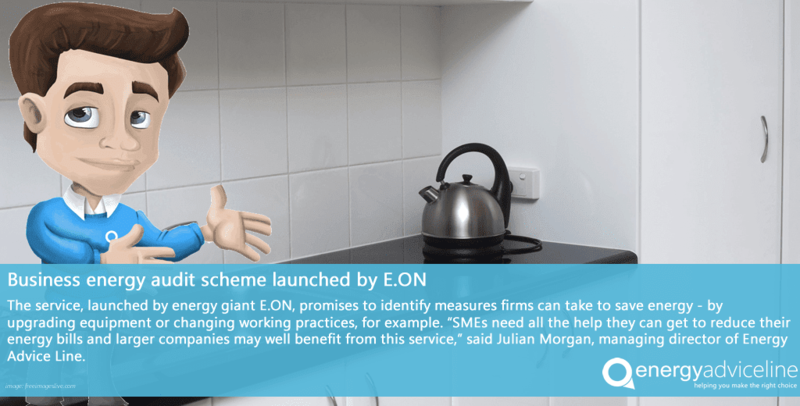 The service, launched by energy giant E.ON, promises to identify measures firms can take to save energy - by upgrading equipment or changing working practices, for example. "SMEs need all the help they can get to reduce their energy bills and larger companies may well benefit from this service," said Julian Morgan, managing director of Energy Advice Line.